Litecoin (LTC) can be traded versus the US Dollar (USD), which is a crypto pair called LTC/USD. This article will review this financial instrument and how it can be traded. It will also review technical analysis, price movement, expected volatility, and how traders can trade Litecoin on MetaTrader 4. 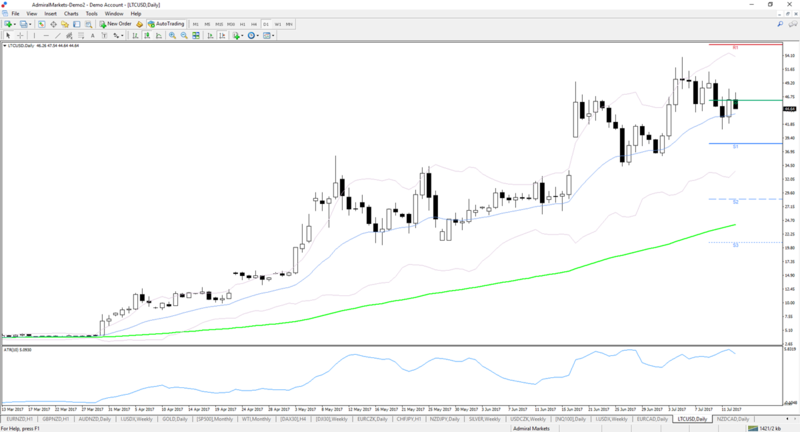 The short answer is simple: yes, Litecoin CFDs are volatile and show strong price movements. The LTC/USD crypto pair has shown sturdy momentum and has seen a significant increase in its average price range. This becomes easily visible when you add the Average True Range (ATR) indicator to the daily chart (value 10 i.e.). The ATR value has risen from a value of about 0.2 to nearly 6, which is an increase by almost a factor of 30x (see the bottom indicator on chart above). The LTC/USD pair is up and running, certainly from a volatility point of view. Current vs. Historical Price: Trending or Ranging? Looking at previous years, traders can see that the LTC/USD pair showed strong momentum back in 2013 and 2014, before going into a mini 'winter sleep' during 2015 and 2016 (see image above). Now the pair is awake again and a slow-down seems unlikely anytime soon, at least not with the increased attention which the cryptocurrency world is receiving at the moment. An established trend is not yet visible on higher timeframes as the LTC/USD pair is mostly showing impulsive price action. However, on lower time frames such as the 4 hour chart, a clear trend is visible and actionable. 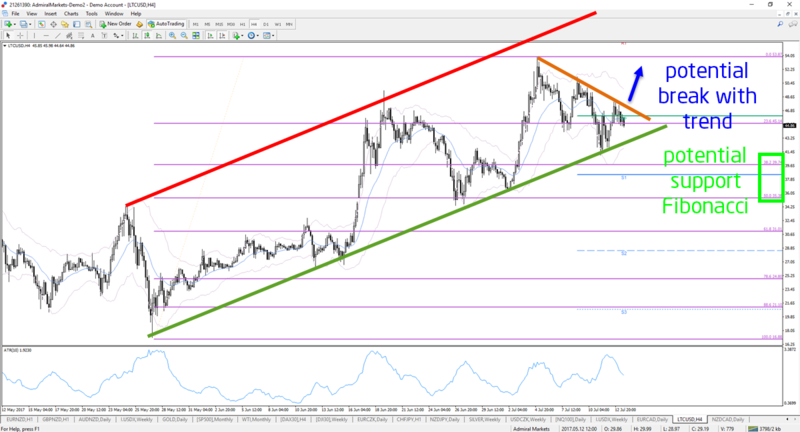 The chart below shows how traders could analyse and tackle such a chart or something similar in the future. Of course, whether the trend remains intact depends on how close price gets to the resistance zone at 50-55, which is one of the reasons Admiral Markets offers continuous live webinars so traders can keep up-to-date with most current events, trends and technical analysis. Trading Litecoin is probably not much different than trading a currency pair, commodity or CFD. When approaching the financial markets, it is also critical to keep in mind that traders are well prepared before entering any trade setups. You might wonder, what does good preparation look like? A trading strategy or trading plan is important as it enables traders to know how and when to tackle the financial markets. It provides an outline of which tools to use and explains at which moments the odds could be stacked in their favour and when not. Trading psychology is vital because risking real money will impact your nerves and possibly create fear and a potential rollercoaster of emotions. Trading psychology allows traders to formulate a proper response and helps them handle these situations. Risk management is critical. It allows traders to protect their capital, which is needed to access the financial markets. Without proper risk control, traders tend to over risk on one or a couple of trade setups, which may lead to large losses and drawdowns. See the video below for more details (English only). Which Strategy Should You Use to Trade Litecoin? Technical analysis provides an excellent guideline on how to analyse and find trade setups using price action, candlestick patterns, and/or technical indicators. Some traders only use candlesticks for making their decisions, whereas others fully focus on indicators and tools. It is also possible to use a mixture of both price action and candlesticks in combination with indicators and tools. Fundamental analysis or news trading are also methods used for tackling the markets. These traders review the economic data of each company, country, currency bloc – or, in the case of Litecoin, crypto-news – to assess the future potential of the currency. Wave analysis is an alternative method that some traders choose to use to help them understand structure of the financial markets. Wave analysis is based on the Elliott Wave Theory, which explains how the trader and market psychology impact market behaviour and price patterns. All three methods are equally valid and traders can even choose to combine two or all three of them for a full-scale approach. It really depends on the preference of each trader and it always makes sense to try out various approaches to see what fits best with your trading style. In all cases, a key component is to set up a trading plan, regardless of which method a trader eventually chooses. This trading plan must explain, in simple words, how a trader should approach their analysis, entries, trade management, and exits. When day trading Litecoin (LTC) versus the US Dollar (USD), it is a good practice to use technical analysis on multiple frames rather than fundamental analysis, which is mostly applied on higher time frames, and wave analysis, which is a more advanced technique. Technical analysis allows traders to build varied trading strategies based on candles, price action, and technical indicators. There is therefore a wide range of options to build a trading method that matches your own unique style. More is explained in the video below which discusses trading systems and methods based on indicators (English only). Higher time frame like a daily chart: this is useful to spot key support and resistance levels and understand the overall market structure. 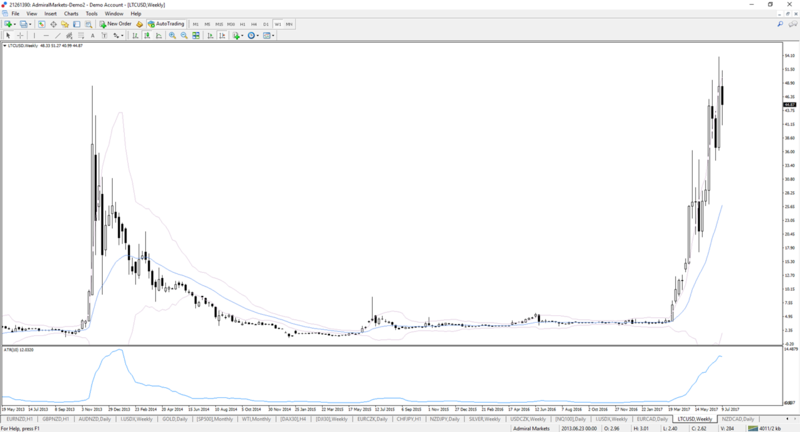 Medium time frame like a 1 hour chart: this shows the immediate trend, momentum, and key patterns and is used to choose the best direction for trading. Lower time frame like a 15 minute chart: once the two higher time frames show a 'green light', traders can hunt for trading opportunities on lower time frames, which provides a detailed view on how traders could enter a trade setup. The 3 step process helps traders avoid trading against the trend or when price is very close to support or resistance levels. This is of course just one useful tip. For more value added advice on trading Litecoin, it is recommended that you join our live trading webinars and download the MetaTrader 4 Supreme Edition. MetaTrader 4 Supreme Edition provides traders with extra help to analyse and tackle the markets. This free package is an extra plugin on top of the standard MetaTrader 4, featuring 60+ extra features. It offers trade and risk management solutions, a full package of indicators, different types of charts, a trading simulator and much, much more. Can Traders Make a Return on Their Investment With LTC/USD CFDs? Yes, traders can benefit from the market volatility of the LTC/USD pair, like other financial instruments, to earn pips and a return on their investment. There is little difference between trading the EUR/USD, USD/JPY or LTC/USD from this perspective. It is important to keep in mind that the pair of financial instruments does not have high spreads and shows decent volatility and price movement. After that, it is really up to the trader to find a chart and/or system that suits them well and matches their trading style. Traders may make a profit from trading LTC/USD, but keep in mind that long-term consistent profitability requires proper investment in your trading skills. 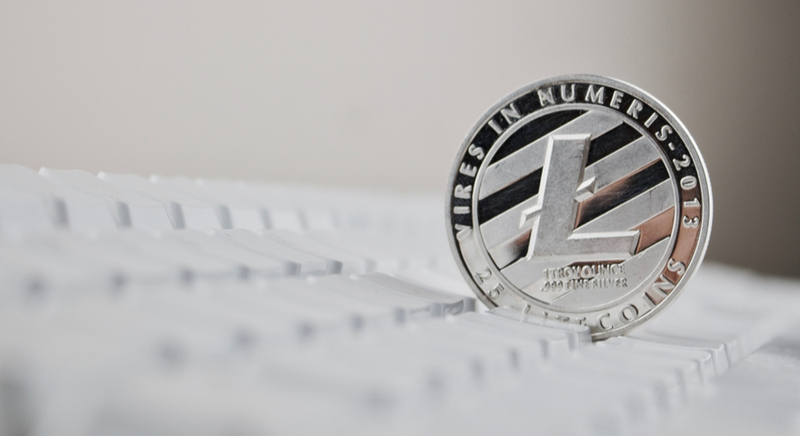 Market Sentiment: Is Litecoin Trading as Appealing as Bitcoin? Yes, traders can trade Litecoin CFDs just as easily as they can trade Bitcoin CFDs. Both crypto pairs show impulsive price action, which can be analysed and traded. 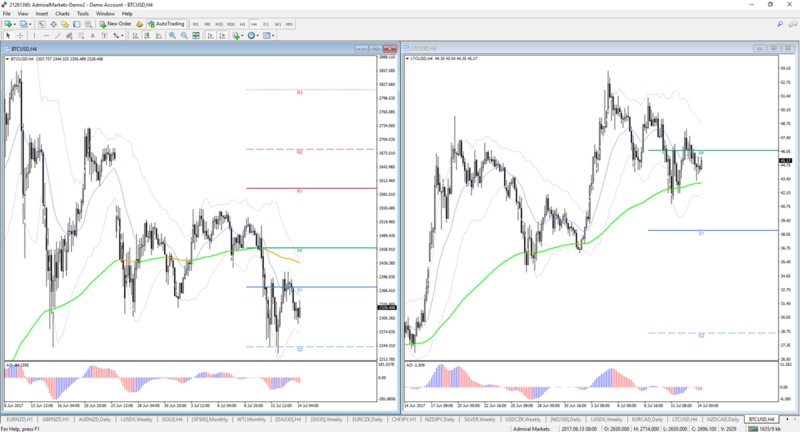 In the image below traders can see price action on both pairs during the same period of time. Besides trading Litecoin versus the US Dollar (LTC/USD), Admiral Markets traders can also trade Bitcoin vs. the US Dollar (BTC/USD), Ethereum vs. US Dollar (ETH/USD), Ripple vs. US Dollar (XRP/USD) and Bitcoin Cash vs. the US Dollar (BCH/USD). It's possible to trade cryptocurrencies with Admiral Markets, including Litecoin versus the US Dollar (LTC/USD). Traders can access LTC/USD and other crypto pairs via both the MetaTrader 4 and MetaTrader 4 Supreme Edition platform. Also, all of the additional add-ons for the MetaTrader 4 Supreme Edition are now available for the latest version of MetaTrader 5 Supreme Edition. Of course, besides cryptocurrencies, Admiral Markets is a broker with a wide choice of instruments, including currency pairs, CFDs and commodities. With live daily analysis, webinars, articles and the extra added tools and expertise, it's time to discover Admiral Markets and make it your number one trading partner!